In a very unexpected turn of events the Norrthern Lights had to play 24 minutes in the last quarter and kick the winning golden point to overcome a tenacious Fiji Vonu. The reigning champions had been held goal-less until the better half of the last quarter. 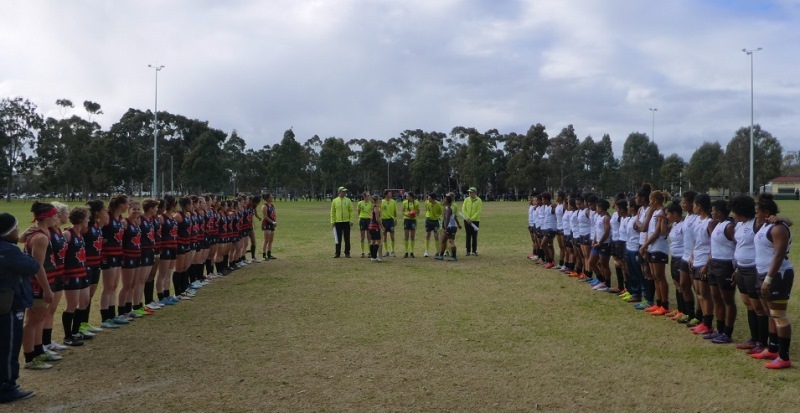 Both teams were welcomed by a somewhat sunny and only reasonably cold weather. Canada won the toss and proceeded to kick with a noticeable breeze. The Canadians and most independent onlookers presumed that this would be a good warm-up hit-out for the world champions. The idea from the Canadians was to push the advantage from the very onset and that’s what happened. Aimee Legault #10 laid a huge tackle and the ball was pushed into attack. The Vonu defended stoutly but some poor kicks out of defence nearly let the Northern Lights in. Eventually the Vonu were able to mount some attacks through good ruck work and rebounds from Vani Serevi #10. Aimee Legault #10 and Valerie Moreau #05 set the pattern for the day for Canada with a lot of work trying to bust out of packs formed by the tight Vonu pressure. At the end of the first quarter Canada had failed to capitalise and at the same time the Vonu had managed to contain the opposition. Canada was 5 points to Vonu 1 point. 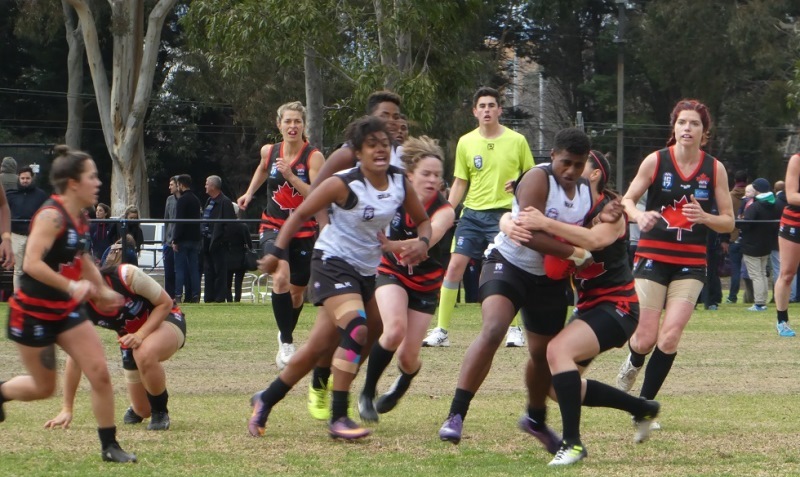 The Vonu were buoyed by the first quarter result and their attacks late in the quarter. They immediately continued on and attacked relentlessly through likes of Litia Matanisigadrau #14,Salote Matakibaui #12 and Jennifer Goddsie #7. Indeed it took until the 7 minute mark for the ball to reach the centre line for the Northern Lights where it quickly returned to the Vonu forward line. It took until the 14 minute mark until some one-twos with Aimee Legault #10 that Canada threatened to score but it was the Vonu defence's turn to stand firm with a good saving mark from Siteri Matana Tadrau #17. When play returned to the Vonu forward line they scored the only point for the quarter despite another huge tackle by Aimee Legault #10 . So at the long break Fiji Vonu had crept to 2 points and Canada was still on 5 points. Talk abounded of a possible upset. For the premiership quarter, The Fiji coach wanted the Vonu to continue the pressure but also run the Northern Lights off their legs by running the ball around the boundary. Canada wanted to open the game up by getting the ball out of the packs more efficiently. Canada pushed early. Margo Legault #6 ran around to miss a snap and Nicola Kirwin #8 marked an errand kick-in but also couldn’t convert. The Vonu repled quicker than the first quarter with work from Makitalena Lawebuka #22 and Iliseva Ratudina #8. For Canada, Margo Legault #6 made a good save and rebound and Renee Tong#9C displayed a good run whilst Aimee Legault #10 again chipped in with a great mark. 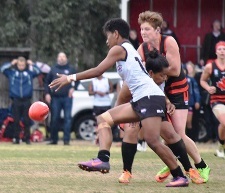 It was the Vonu that mounted the most consistent charge and kicked the first goal just seconds before the third quarter siren. The scores were now were tied with the Fiji Vonu1 goal 2 behinds = 8 points to Northern Lights 8 points. At the three quarter time break Canada divided into three groups as usual whilst Fiji Vonu listened intently to their single coach and his message was very straight forward – keep doing what they were doing. It started to rain to compound the closeness of the game. Luckily it was light and did not affect the game. The Canadians were reading the rucks well and looked to attack early. Vonu mistakes in defence let Canada in and a great rebound and score put Canada in front. Play then opened up and whilst Canada was slightly more consistent it was the Vonu who made the better breaks and set up a big mark and goal by Verenais Caginavanua #21. Valerie Moreau #5 was in everything trying to swing the tide back especially as further points the Vonu put the margin at over a goal. Aimee Legault #10 was trying desperately to get some system going with some linked passes. Relentless pressure by the Northern Lights forced a point and then a goal off the ground found the score again tied at the 15 minute mark. For the next 9 minutes it seemed all the spectators had learned of the situation and descended on the center oval. It was a very brutal affair with every single player of both teams doing their utmost to procure a win. For the most part it looked like the Vonu were going to triumph and only some diving tackles and smothers by the Northwind stopped the flow. In the end some measured kicks and marks got the Canada within striking distance. After some tenacious defence Canada finally was able to get a kick and mark for a winning score. Editor: It must be said that Canada tied the game late, and the winning point was kicked from a mark that appeared to be touched and after what appeared to be a push out - suffice to say a very lucky escape and they will need to build from here to challenge the likes of Ireland. The Fijians can consider themselves very unlucky - look out their next opponents. A little bit of controversy at the end. The Canadian "mark" that led to the last point was initially called "touched" by one umpire, but a mark by another. (That should not happen as only one umpire should be in control. I know it does sometimes - I've done it myself.) It looked like the ball had been touched. Amidst all those hands and arms, a clean mark was unlikely. Overall, the umpiring has been good. (Waiting for the all-American umpires game.) One could say a Canadian win was the "correct" outcome, but a draw would have been better. Looked like a push in the back on the Fiji defender by the Canadian that marked that ball also. Agree can't have two umpires in control. But why no draws? From my position, the final decision was probably incorrect or needed consultation i.e. bounced ball BUT it is most likely Canada would have scored a point being so close to goal. Everybody thought the Vonu was going to win as they pressured for most of the final 9 minutes. it was only some stout defense, rebound and precise play that got Canada over the line.